This illuminates the New York Fed’s article with a slightly different hue. The New York Fed report goes a big step further – with white men as an example, perhaps to avoid getting sidetracked into discussions about wages of minorities. It picked men born in the decade of the 1950s to show what happened to their wages over time. And since women’s real wages actually rose over the period, they might make a less persuasive example of how declining real wages should be considered the new normal. In their analysis, the authors found a common pattern: Wages increase sharply early in the work life, but as workers age, wage growth begins to slow down. There are also variances based on educational attainment, which they separated into five cohorts: Master’s or higher, Bachelor’s, some college, high school diploma, and less than high school. Real wages tend to rise early in a worker’s career, flatten out mid-career, and then decline as the worker approaches retirement. This inverted U-shape pattern is a well-established feature in the labor economics literature. Labor economists explain the rapid real wage growth early in a worker’s career as a combination of on-the-job learning and better matching of workers to jobs. A large portion is due to job matching as workers change jobs in search of a position that better utilizes their skills. As workers age, the decline in the pace of their real wage growth reflects a diminished incentive to invest in new skills (because their remaining work life is shorter) and fewer job changes (because they have found a good job match). “Negative growth,” age 55 and older. Now there’s another problem mucking up the overall and ever-elusive real-wage growth miracle everyone has been counting on: demographics. The US population is aging. There are more people aged 40 and over in the workforce, and their incomes are now flat or declining. The portion of the population in the first phase when wages are growing fast has plunged from close to 60% in the 1980s to the mid-40% range currently, the report said. And the portion of workers with wages in the “negative growth” phase has ballooned. Given the demographics, real wage declines among workers over 50 will continue to hammer the national averages. That is why real wages in the US economy are in such trouble, and it’s normal, and the fact that it’s getting worse is normal too, according to the report. But real wages determine consumer spending. Consumer borrowing can fill some holes, but not in the long run. In the long run, only wage growth can prop up spending. And if the current trend holds, as predicted by the report – with the number of workers over 40 ballooning – then consumer spending is going curdle further, for years or decades to come. Or is it really all just inevitable demographics, as the New York Fed would have it? This entry was posted in Banana republic, Doomsday scenarios, Dubious statistics, Economic fundamentals, Federal Reserve, Free markets and their discontents, Guest Post, Income disparity, The destruction of the middle class on September 28, 2016 by Yves Smith. and the bonus is that no one wants to hire you if you are over 45.
and why should investment by employers in skills matter for older workers when the average time for working for a single employer is about five years? In the gig economy, you average time working for a single employer will drop to equal your 15 minutes of Andy Warhol fame ;-( … unless of course you are management. But don’t blame management, it is the hidden hand of the market! The current real world employment experience of millions of Americans has shown little improvement since the end of the Great Recession. Your link also shows a long term decline in workforce participation for college educated male workers from 98% in 1964 to 95% in 2014. This may not seem like much, but if the mantra that more education is the solution to any employment issue, this indicates that a college degree is losing its value in the labor market. And it is not that high wages, and accumulated wealth, have allowed college educated male workers to leave the labor market willingly to pursue leisure opportunities. The number of public companies have been cut in half in the last 20 years. Just for one metric. So for those born in the 50’s, reaching middle or senior management by the time they were in their mid 40’s (1999) was increasingly harder as the probability of getting squeezed out multiplied. In the last ten years, the birth / death rate of startups / small business has reversed as well. There is probably ten other examples of why age is not the mitigating criteria for the decline in wages. It’s not skill sets, not ambition, not flexibility. Pure number of chances for advancement and therefore associated higher wages has declined precipitously. Anti Trust Enforcement went out the window as Neo-Liberal policies converted to political donations for promoting consolidation. Now watch even those in their 20-30 age group will experience the same thing as H-1b unlimited takes hold with the Obama / Clinton TTP burning those at younger demographics. Are you going to say they are “too old” as well to write software? Tell me where you want to go, and I will focus on selective facts and subjective interpretation of those selective facts to yield the desired conclusions. Barack Peddling Fiction Obama – BS at the B.L.S. – has a multiplicity of these metrics. Hmm…Because wages are “sticky downwards” it would be helpful to see the inflation rate on that first chart. Nominal wages are sticky downwards but not real wages. That is why the FED, the banks, the corporate sector and the economists support persistent inflation, i.e. it lowers real wages. The “study” correlating wage growth with aging is one of thise empirical pieces by economists to obscure the role of inflation in lowering real wages. Real Wage Growth chart very interesting, crossing negative at about 55 for no college, and 43 for a Bachelor’s degree. 43!! Not even halfway through a work-life, and none better since 2003 at best. Yes it is the inevitable consequence of demographics, but not because the population is aging. It’s the overall population growth, which is being deliberately caused by an excessively high pace of immigration. Post-1970 immigration policy has already increased the population of the United States by about 100 million beyond what it would have been without that policy change (check out ‘demographic momentum’ on wikipedia). It is scheduled to increase it to about a half billion by 2050 or so, and we’ll likely pass a billion before the end of the century. Supply and demand, people, supply and demand. The notion that we need a young population to be prosperous is of course rubbish, as you can easily see by looking at Haiti and Bangladesh and Mexico etc.etc. If the labor market was tight, employers would hire older workers and they would pay them well because they would have no choice. But if the labor market is flooded, employers can just dump grandpa by the side of the road and hire a new young worker. Although there are those who claim that the law of supply and demand is racist. It starts with the “starter jobs”. The jobs that the high school kids who weren’t going to college (fast food, construction, landscaping, etc) are now done by compliant, non-argumentative immigrants. It used to be that dealing with argumentative, non-reliable kids was the price you had to pay for cheap labor. Now, starting wages are so low, that the choice kids have now is “go broke at home” or “go broke slower while working 40 hours/week”. Everything must fit rational expectations, at least in the Fed. At least this describes one mechanism on how demographics influence household income. Wrong. Try “age discrimination”, with a little “…….employers desire the skills, but don’t want to pay extra for them……” sprinkled in. Not to mention the current trend for filling positions in lower level management. Used to be that managers were chosen from the guys who had risen through the ranks in the department. Now, open management positions are filled with women from administration or HR, or BS Artists. One of the reasons I baled in 1999, at age 42. The trends at my former employer were not my friend. That, and I got tired of being passed over for men/women who continually needed my help to do their job.
. . . As young adults, their wages soared by up to 10% a year. Then the rate of growth fell off sharply. 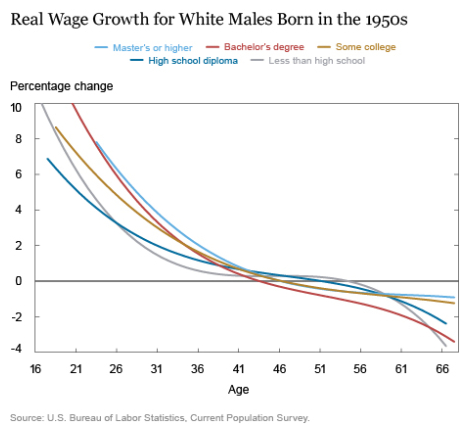 When the men in this cohort turned 40 in the 1990s, wage growth disappeared. By around the year 2000, the real wage peak in the US, when the oldest men in this cohort turned 50, wages had begun to decline for most of them. By the time these men were in the mid-50s, their wages across the board were heading south – and for many of them, rapidly. All of that and no mention of globalization. Of course the useless eaters at the NY FED, with their cushy six figure salaries are clueless when it comes to the reality of the peasants lives. Shutting down manufacturing, which are decisions based on CEO greed, and getting stuff made in slave wage countries like China, where in the the time period discussed from the mid nineties onward the pace of work transfer was a flood. Let’s look at Carrier and their recent decision to move air conditioner production to Mexico. Can those employees in Indianapolis find equivalent employment after the factory there closes? Obviously, no. Furthermore, where exactly did the expertise to build air conditioners come from? That expertise comes from labor. The decades of production and constant improvement by the employees has led to an efficient factory that churns out profits and now that expertise is plucked by management and transferred wholesale to Mexico. All this time when the bosses ask for ideas on how to make things “better” and document down to the last detail what is involved in a particular operation was only so that the executives, when the time was ripe, exercise their particular flash of brilliance, which is firing the $20 per hour employee and hiring the $20 per day employee and pocketing the difference. For the peasants here and there, globalization is a disaster, and for NY Fed “economists” to gloss this over like it doesn’t even matter tells you what the ball garglers of the elite want you to believe. No economist yet has ever explained why we ended up with 100% of consumer electronics made in one country. hmmm…so who crashes first, us or china? It seems our demographic problems will affect the issues from the post on china as we continue to consume less, but this may be too obvious? I have a number of non college tech friends who are in their mid 40’s and facing job loss as (IMO) easy money is harder to get and venture capital gets leaner and meaner and stops funding just any spaghetti stuck to the wall, and looking at taking a job at lower pay is to them career suicide, pondering whether I should forward this to them or if it’s too depressing for someone trying to keep their hopes and habits alive…on the other hand, and not so ironically, they’re for the democrat so maybe they have a serving of humble pie on the menu? Not that the republican is much better, and although that candidates claim is that jobs should stay here the country is so deeply fractionalized that I don’t expect much to be accomplished by either one…whatever trains have left the station at the end of the current presidents term are going to chug along through the next presidents term, regardless of consequences to the greater whole, I expect the TPP to find a great deal of support, but not until november 9 2016 so the fight is upon us, if they get it we’ll be stuck with it, and if we stop it they’ll be shackled for a time at least. It’s crappy accounting rules, idiotic ideas about money and ‘creating value’ as some kind of Sorcerer’s Apprentice ‘copy + paste’ process, and far too much privilege in tax and accounting rules given to ‘capital’ (patents, copyright, intellectual property, commercial/real property). ‘Inevitable demographics’ signals a failure to think clearly about what creates value, and how to more accurately measure value. It’s also a social and economic failure to hold people like Exxon, the Koch Brothers, and others who create negative externalities, accountable for the true costs of their activities. Disingenuous management became more noticeable over the past few decades. At one point, there was a semblance of caring about employees and that tapered off as outsourcing, downsizing and re-engineering took over. Now there is more of a sense of disentitlement, meaning you should be glad to have a job so stop asking us anything. My casual survey of employees finds that there is virtually no loyalty to employers beyond the next paycheck. Brand equity has a component of human capital, and that seems more tenuous, although I’d be interested in finding out more about any academic research on the topic. One truism from the business world concerns training. Would you want to work for, or do business with, a company that did not invest in its employees? I worked at a company that decided that its IT staff didn’t need all that (read, any) training, and the results were what you’d expect. They only relented when the customers started asking about certifications. AND the things we need cost more. Health “care”, Housing, Education, Food, and Transport all have gone up in price, and even hyperinflated in areas (like housing and education), often requiring debt to aquire such basic goods and services. So that even when those do start to see a higher paycheck – the middleman is getting a bigger and bigger cut so that by the end of it all, the worker just has less and less disposable income to spend on other stuff. Additionally, the increasing waning benefits offered to the workforce also kicks into the real depression on consumption and growth. For example: the US is one of the worst countries in the world when it comes to paid time off. Even those who have it rarely even use it because of the fact that employers have so much control over workers in the US. Pressure to not take time off, answering emails at home, all of this takes away time to have fun, run important errands, etc. Thanks to low union and labor participation rates and an overall indebted workforce. Orbitz is literally BEGGING people on social media to take vacation time. Less PTO taken = less tourism+fun = less consumption. There’s a reason why weekend flights are always over booked times a billion: people don’t have enough time to take off during the week to take flights that are less likely to be over booked during the middle of the week. And take health “insurance”. For example, at the company I work for, I am making the most I have ever made hourly in my life, $24/hr. But I am a contractor, and have been for 6 months. So I don’t get health insurance. And I make more than the Federal Poverty Limit (which is too low, IMO), but not enough to afford the premiums. So (since I am a healthy young male), I decide to say, “screw it, I’ll just pay the penalty”. So here I am, making around $35-45k/year, and instead of taking the tax refund I’d usually get and buying stuff and frequenting businesses around my area with it, I am essentially forfeiting it to the government, who will use to to pay off Aetna/Cigna, etc. Their stock price goes up, and they make money (while not paying taxes, like I do), and I get the shaft. How does anyone think this is sustainable? Larry, thank you for this. I might add that all of this has been going on for my entire work life, particularly beginning in the late 1980s. I feel like I’m on the gerbil wheel, permanently running in circles just to stay in place–keep a roof over my head and food on the table, and it gets harder and harder every year. And now the bank pays me next to nothing on the meager few dollars I am able to save. Can’t these people see the train coming down the tracks? After listening to the Hopium pipeline from Washington and especially after hearing Hillary hooting about “the recovery”, one things for sure, this ‘white boy’ and my friends that are aware of economics are going on a politically motivated buyers’ strike until after the election. no spending on anything but food and utilities. Black Friday this year is going to be interesting, that’s for sure. No, that’s called the Peter Principle. The good thing about elites is that they are so greedy they tend to destroy the system themselves. Time for a “New Deal”? The world is swamped in investment capital and you have to pay people to take it off your hands, no one wants it as there is nowhere to invest. We removed free and subsidized services to those at the bottom, wages now have to be spent on these rather than other products and services in the economy. We raised the cost of living through ever rising costs of housing, healthcare and student loans, wages now have to be spent on these rather than other products and services in the economy. Supply never did create its own demand. A Keynesian “New Deal” with plenty of redistribution is what is needed. In 1992, Ross Perot, in the US, said economic liberalism was just 19th century capitalism. He was so far ahead, most people didn’t realise at the time. We had small state, raw capitalism in the 19th century in the UK. The rich were very rich and the poor were very poor. They maximised profit by using the cheapest labour possible, e.g. slaves and children. The first regulations that came in to deal with the wealthy UK businessman maximising profit were the abolition of slavery and child labour. The slave owners had to be compensated of course, the slaves got their freedom. The economists at the time never thought the poor would rise out of a bare subsistence existence. That was the way it was, and always had been. This particular enslavement of the masses involved bringing large groups together in factories and ideas started to spread about using collective action to withdraw their labour. Conditions gradually began to improve through no generosity of the wealthy; all gains by the masses had to be taken by force. Productivity continued to rise and advertising now intrudes into every corner of our lives. They have got so much stuff to shift, they need to use every means possible to off-load it. Economists decided the system was supply side constrained and economic liberalism (19th Century capitalism) was the solution. Wealth polarised, the middle class started to disappear and demand became very subdued as people maxed. out on debt. Central bankers throw in trillions to keep this dying system alive, but the stagnation of the “new normal” is the best they can achieve. 19th Century capitalism and a consumer society always were mutually exclusive.